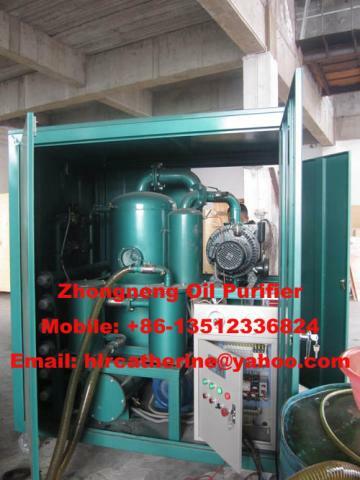 transformer oil,super high-voltage transformer oil,switch oil and other insulating oils. install and maintain oil-immersed transformers. and vacuun drying equipment for transformers,and it is cost-effective,easy to operate. make limiting vacuum ≤ 5Pa,working vacuum ≤ 35Pa. 2. Large area three-dimensional flash distillation technique,advance dewatering and degassing system,which remove water and gas much quickly and completely. 3. Precise filtration system,high-quality filter element,multi-stage filtration with gradual precision,which help removing mechanical impurities in the oil. 4. After purification the breakdown voltage of transformer oil can reach up to 70KV. 5. Advanced double-infrared liquid automatic controller,pressure automatic-protector,which ensure long-term safe and reliable operation. 7. This machine can be operated both on-load and off-load. 8. Humanization design,low noise pump,deep purification and long-term free maintenance. 9. General type,Trailer-mounted type,Hermetical type,Flow meter etc. is available.